The kids are at home, and they say hungry all the time. Try this recipe, which does not require long listed ingredients and long cooking time. Just make sure, pancake mix and Nutella are handy. And that’s it, if needed place an almond along with Nutella while stuffing, which adds crunchiness and also good for the kids. Kids holidays are over? 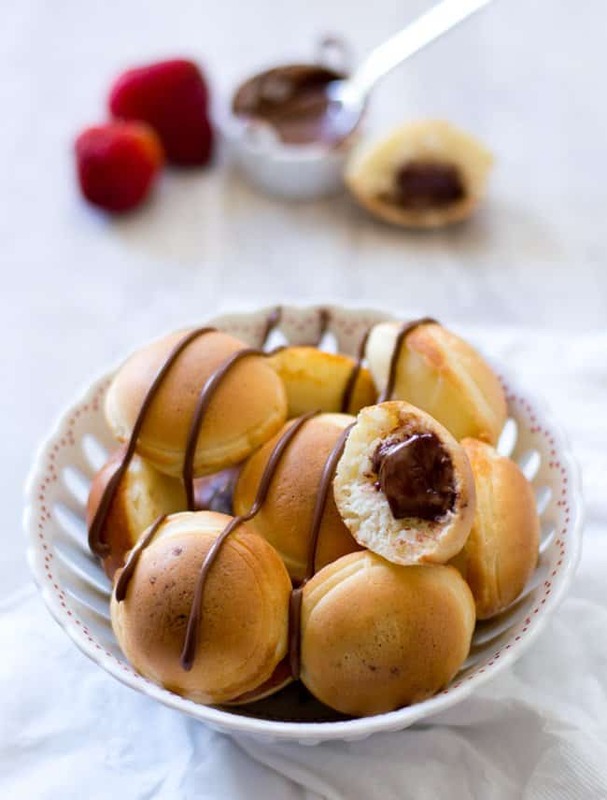 still, this Nutella stuffed pancake popper recipe is useful, you can pack them for school. The children will love it for sure. I made these after, Blueberry pancake poppers, Vegetable pancake poppers, and zucchini pancake became a huge hit among the readers. Where can we get these molds? Well, they are cheaper, ranging from $14-$25 on Amazon. They can be under the name of ‘cake pop maker’, or ‘Danish’s Aebleskiver Pan’ or ‘Indian Paniyaram pan’. Do your own research, and get the better one. Nonstick / cast iron are the options should be considered while buying. 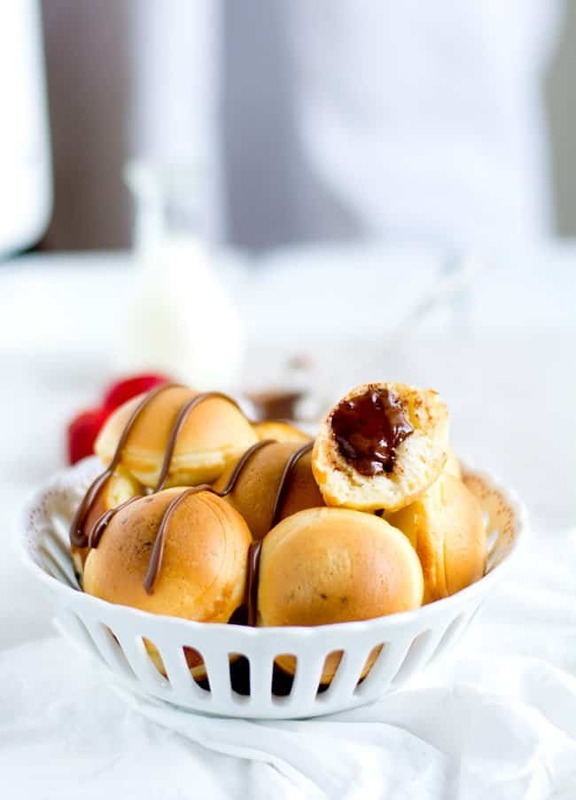 How to make Nutella Stuffed Pancake Poppers? 1. In a mixing bowl, add a cup of pancake mix, an egg and half a cup of milk. 2. Whisk until everything blends well and no lumps seen. 3. Heat cake pop pan over the stove. And when the pan is hot, drizzle few drops of oil. In the pan, fill half with batter to each compartment. Hint: Nonstick pan, needs very lesser oil. 4. Add a teaspoon of Nutella to each compartment, and fill the rest with pancake batter. Hint: Fill each compartment completely so that Nutella should cover completely well. 5. Cover it with lid, to get evenly cooked. In simmer flame, cook it until both the sides turn golden brown and the center gets cooked well. 7. The leftovers can be refrigerated for about couple of days. Instead of Nutella, fresh fruits, jams, jellos can also be stuffed. Add your kids favorite nuts, to make it nutritious. Cooking in simmer flame helps to gets it done cooked evenly. So, maintain simmer flame throughout the cooking process. Serve as a breakfast or snacks. Can be packed in boxes to the school time as well. 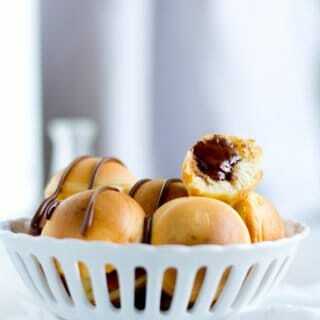 Nutella Stuffed Pancake Poppers does not require any dip or side dish. If wanted serve with any syrup. 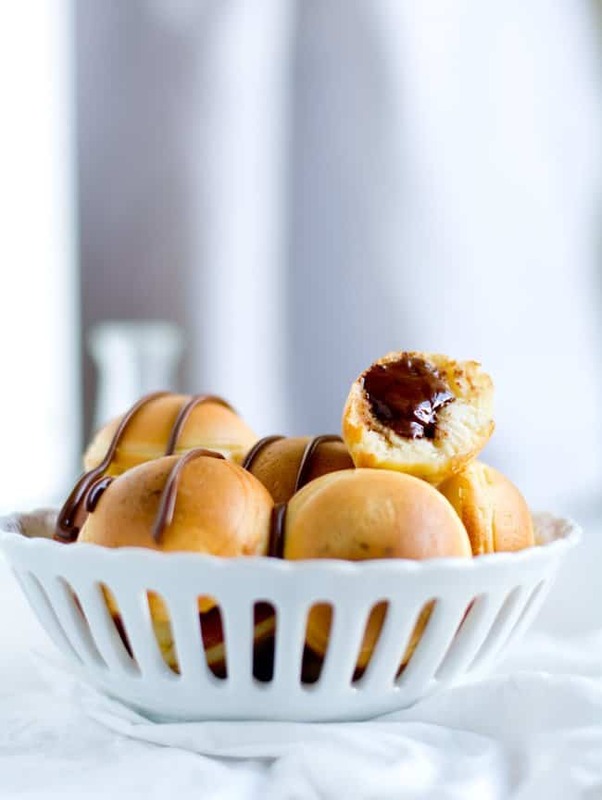 These Nutella stuffed pancake poppers is going to be loved every kid in your family. With just few ingredients, you can make these super easy dish. In a mixing bowl, add pancake mix, egg and milk. Whisk until everything blends well and no lumps seen. Heat cake pop pan over the stove. And when the pan is hot, drizzle few drops of oil. In the pan, fill half with batter to each compartment. Add a teaspoon of nutella to each compartment, and fill the rest with pancake batter. Hint: Fill each compartment completely so that nutella should covered completely. Cover it with lid, to get evenly cooked. In simmer flame, cook it until both the sides turns golden brown and center gets cooked well. The left overs can be refrigerated for about couple of days. This gets cooked in the oven or on the stove top? method i described was stove top. The pictures make these pancake poppers look tasty! What if I don’t have cake pop pan? you may try using muffin pan or simply try making small sized Nutella stuffed pancakes. Looks yummy! Thank you for sharing Sujatha. Glad you liked these delicious bites Doni.